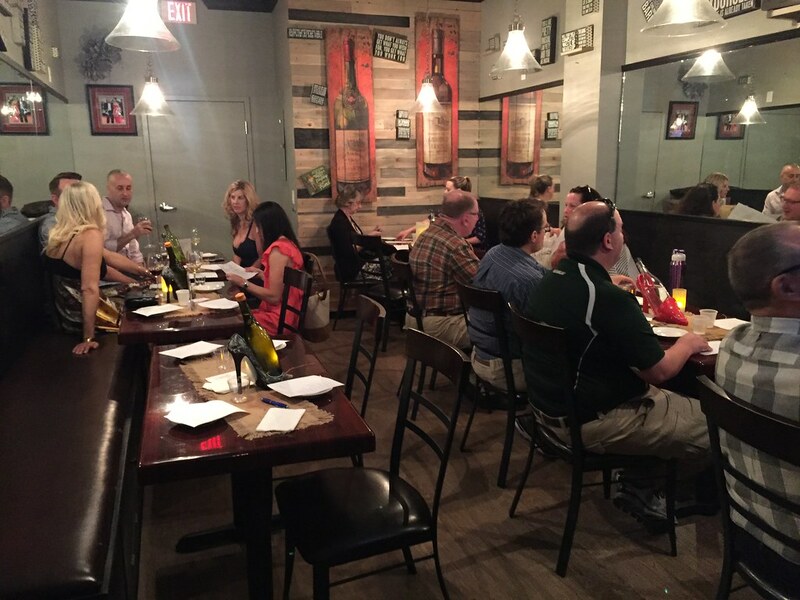 In order to celebrate National Cheese Day, we found an event at a local venue that pairs WineAndCheese. This was our first time visiting Cheese Please and we wondered how we had never come across this place before? We found out that they opened just after we left FL so that explains it. They offer wine tastings on Thursday nights and cheese tastings on Friday and Saturday nights. What a perfect place for those of us into wine and/or cheese. The owners Michael and Carlos were so much fun to hang out with. They say Cheese Please offers Cheese with a Side of Men. When we saw the scrolling slideshow of the male models across the room, we knew it was be a fun evening. The space is set up with three different rooms, I mention this because the shop is pretty deceiving when you see it from the outside. You enter into the cheese shop, where they carry probably 40-50 cheeses in refrigerated cases. Then you continue into the bar area where you can hang out for happy hour or get a delicious grilled cheese with a shot of soup! If you walk further, you end up in their small event space, the room where our tasting took place. It has about 10 tables set up for all the crazy cheese fun to occur. It’s kind of close quarters but made it a very interactive setting. Since they have so many cheese tastings, they are different themed. I’d been watching the website for which set of cheeses we’d be able to come out for. French vs British cheeses sounded like one we’d enjoy so we made our reservation online, $35 per person. This did seem like it was a little high but that was until we found out we’d have 3 different wines with over a dozen cheeses. Not to mention a tasting lead by Michael, the Queen of Cheese Please. The event was fun, so informative, and delicious! I was really able to nerd out with all the cheese facts they shared and even found out a few new tips. For example, did you know you should slice brie the “long way” in order to give everyone the proper ratio of cheese to rind? Or what about the fact that blue cheese will spread to other cheeses and foods, so you need to keep it separate in your fridge. Michael also told us that you can identify a goat cheese by noticing the white color. It is always white because the animal breaks down the chlorophyll when it digests the grass. The evening was set up with cheeses on bread/crackers, then paired with a delicious condiment, modeled after the traditions of cheese in Europe. There were also three different wines served with the wines. Needless to say, we were all pretty happy from all our wine and cheese indulging. When we signed up for the tasting, they said the focus would be more on the cheese and less on the wine. How appropriate for National Cheese Day! Our first wine of the evening was a Chardonnay from Argentina. It was pretty different than Chardonnays we’ve previously had. It smelled sharp and clean and although there wasn’t oak, I did smell butter. The flavor was soft and sharp, with some lemon butter. We began our cheese indulgence with a comparison of brie cheeses, Belletoile vs. Red Chili Pepper Brie. The red chili pepper brie smelled like red chili hot sauce, and tasted smoky and buttery. Neil thought it was a good spice and I noticed the finish to tingle my mouth. We paired the Chardonnay with the cheese and the wine kicked up the spice. Neil even found the bread to increase the heat. 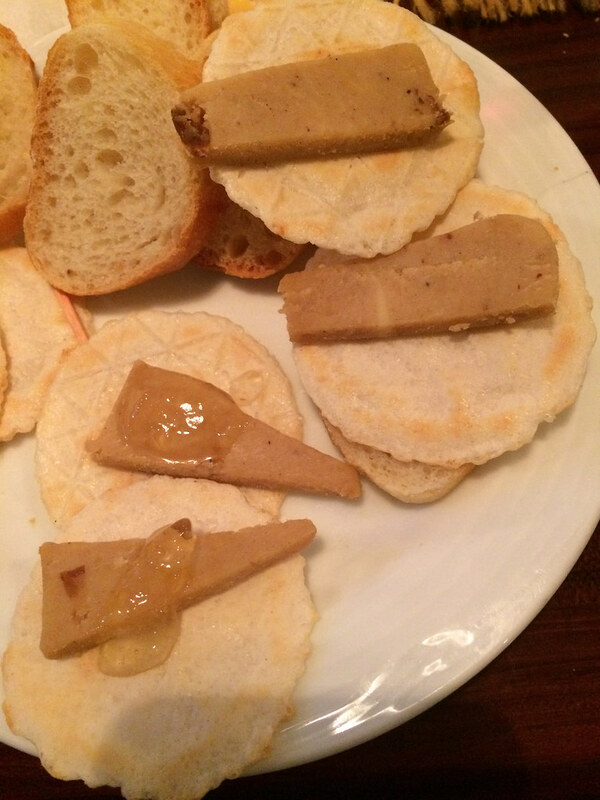 We tried the Belletoile with an IPA Beer Jelly. The jelly was light but the cheese smelled like cow’s milk with a slight funk. It was a mild brie: creamy, buttery, light smoke with a funk in the finish. We paired the belletoile with the white wine too. It made the cheese more smooth and the wine funkier. Neil thought the wine was more interesting with flavors of earth and fruit. The Ossau Iraty PDO began the portion of the evening with the funky cheeses. This one smelled like a stinky funk that reminded me of Pho. Neil found it to smell like grass, funk and a slight salt. When we tasted the cheese, it had a dry, chalky, and creamy texture with flavors of grass, a slight barnyard and SALT. We both paired the cheese with the Chardonnay. I thought the wine became more crisp and tart while Neil thought the wine was more dry and just kind of ok. 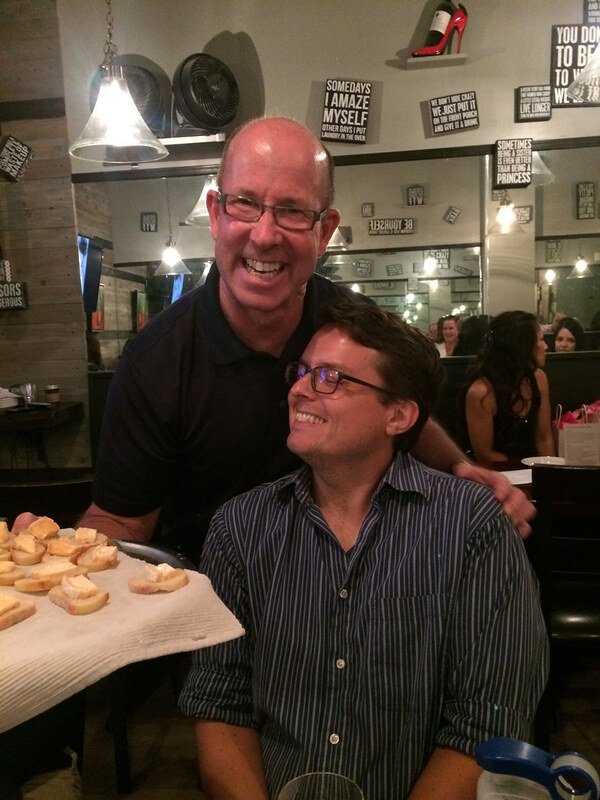 Although he wasn’t a fan of the wine and cheese pairing, he did like the rosemary and fig jelly with the cheese. He said it smelled like fig and was a delicious blend with the cheese. The flavor and texture of the cheese became more creamy! 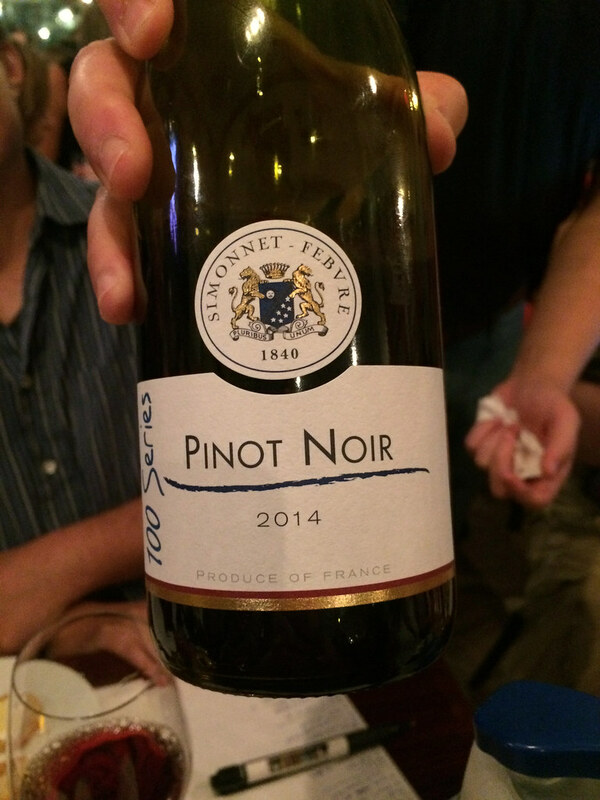 The Pinot Noir was from France but not from a specific region. It has fruit, spice and earth aromas with soft, dry, berry/cherry flavors and spice. When comparing capricho, the younger goat cheese against Cana de Cabra, an aged goat cheese, we could definitely tell the difference in age. The Capricho smelled fresh, where the other cheese smelled like barnyard funk and stung the inside of my nose. Both cheeses were creamy and had the noticeable tanginess from the goat’s milk. I really enjoyed the meyer lemon pepper jelly! It tasted like salsa with just enough spice. We paired the pinot noir with both of these cheeses. The wine pairing with cana de cabra, made the wine just eh, but the funk increased in the wine after pairing it the with capricho and a flavor of tobacco appeared. The Chaumes PDO is an example of a washed rind cheese. Michael explained that this type of cheese has live bacteria around the rind and that’s what makes it so funky!. Usually these cheeses are really funky on the outside but then the inside of the cheese is more mild. It smelled like an earthy funk that Neil called a “super funk!”. The flavor did initially seem light but then there was a funk finish that Neil found to be sour but also good. The pinot noir was influenced by the cheese, since it tasted lighter but smelled funky and had funk in the finish. 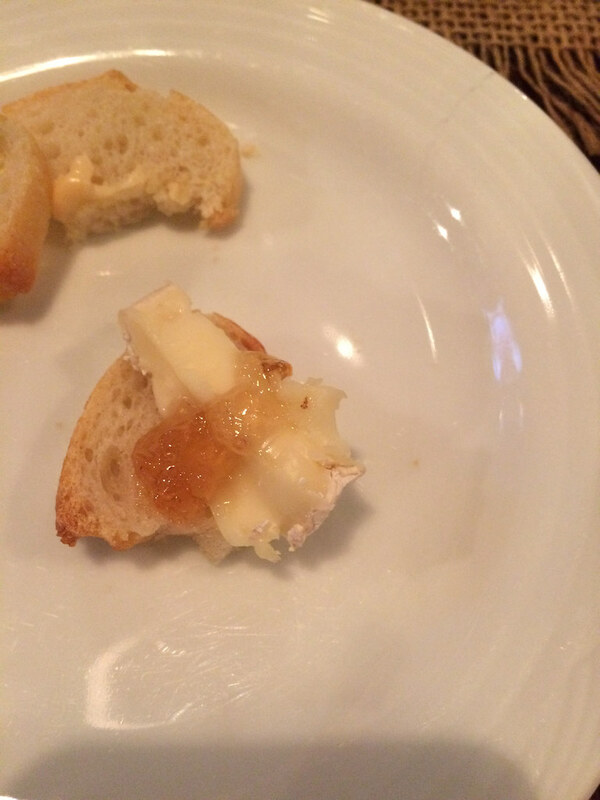 The mimosa wine jelly was a nice complement to the funky cheese. It toned down the funk, tasted like orange and made the cheese a little more tart. Neil simply said it was super yummy. We tried both an Irish cheddar and a cheddar from Vermont that day. The aged Irish had salty and funky aromas and flavors. The texture was smooth, creamy and a medium hardness. We even picked up a hint of smoke and some butter. The vermont cheddar was paired with “crack” aka Bacon Marmelade. We smelled bacon and onion aromas and it was smoky and smooth. We figured the vermont cheddar would be pretty tasty on its own so we asked for a sample without the “crack.” The cabot clothbound was smoky, salty, creamy and definitely cheddar. 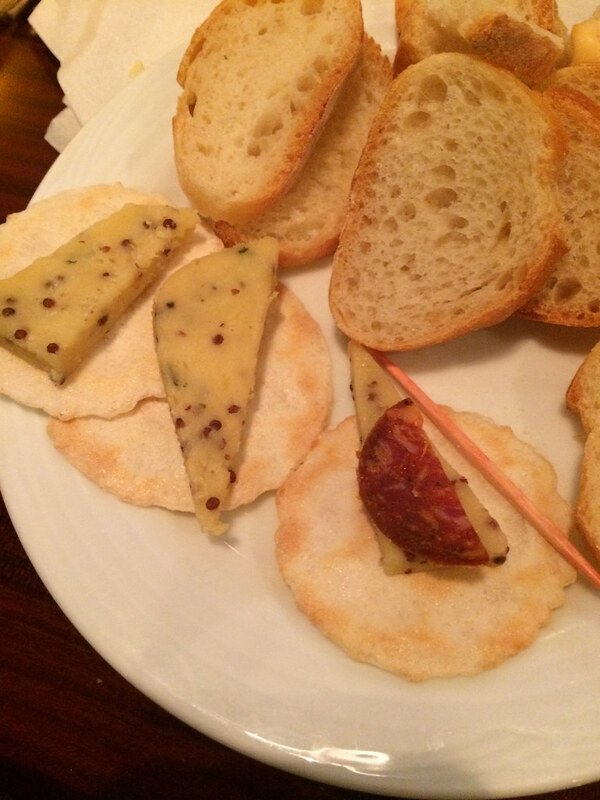 I think one of my favorite cheeses of the night was the Cheddar with Mustard seeds and Ale. It smelled and tasted like mustard but the mustard seeds made the texture crunchy and Neil found it to also have the flavor of cream. When the cheese was paired with a slice of chorizo, you could smell the smoky meat but also taste the mustard, pretty good combination if you ask me. 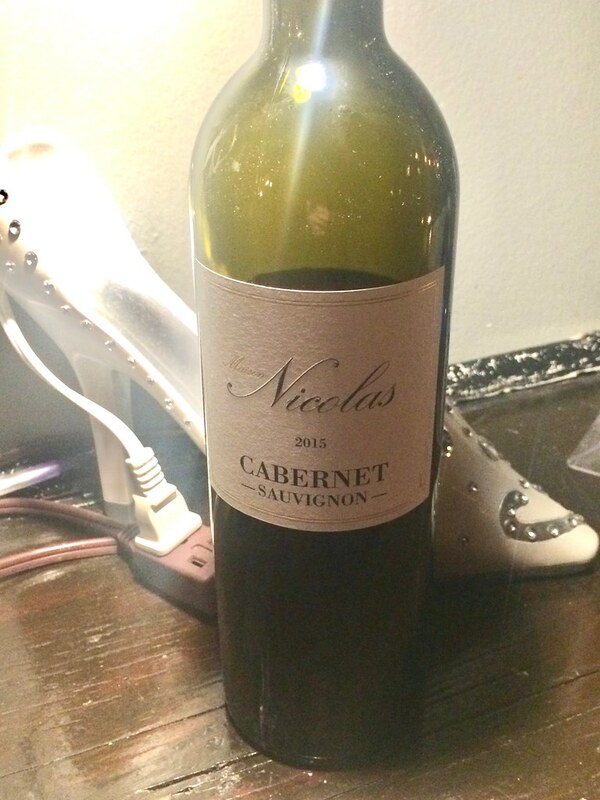 The cabernet sauvignon was also from France. 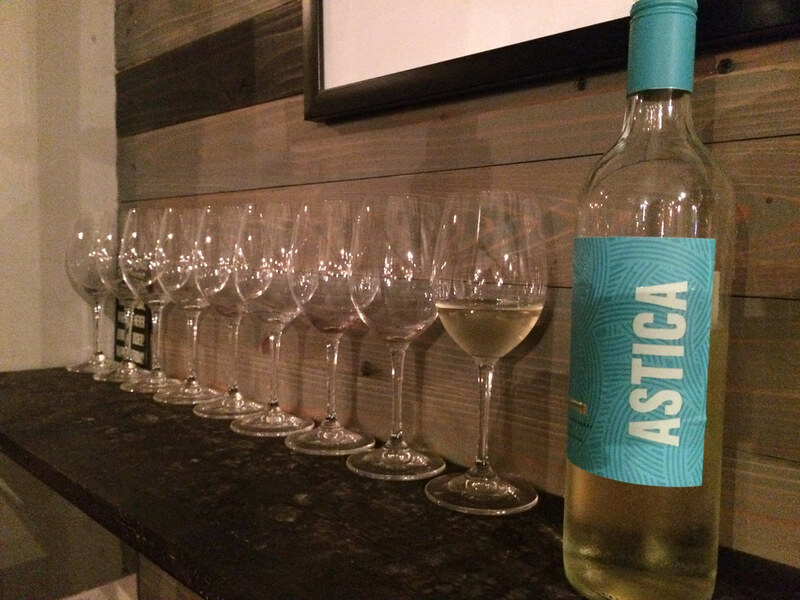 It had earthy aromas with fruit and dry flavors and a soft finish. I liked that it wasn’t very heavy. Not sure if we’ve ever had a cheese with onions but this was a double dose of onion. 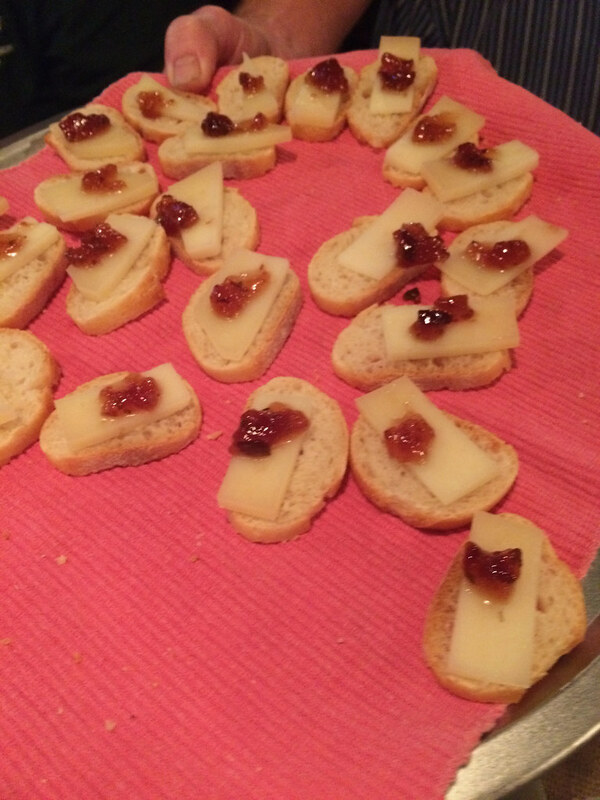 We paired cheddar with carmelized onions with a sweet onion pepper jelly. The cheese by itself smelled like onions and smoke and had large pieces of onion. I really liked the fudgy texture and Neil made note of the very slight cream. I paired the cheese with the Cabernet and the wine became more dry. Neil and I agreed that the jelly only had a light onion flavor. If you like onions, I’d definitely recommend this pairing, especially for the delicious texture of the carmelized onion cheese. 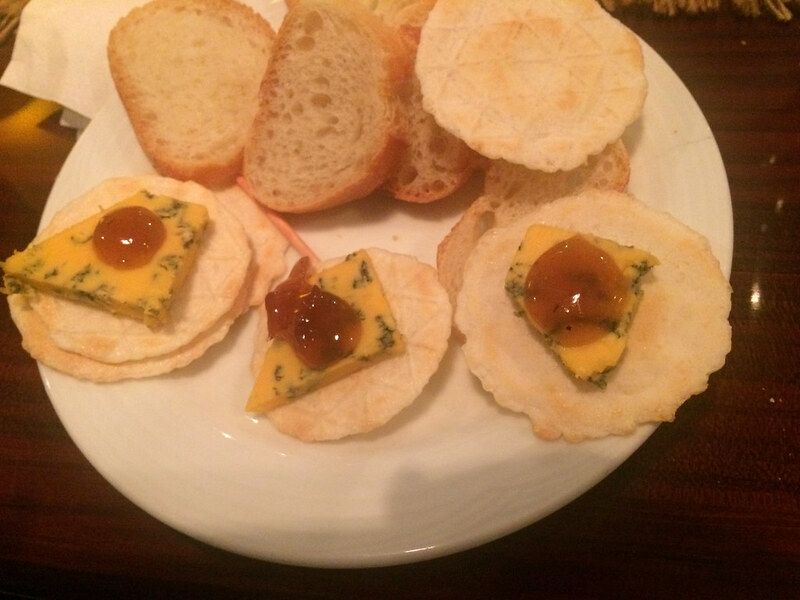 Our final cheese of the evening was Shropshire Blue paired with Roasted garlic and onion jam. The texture was smooth and creamy with flavors of smoke, onion, and salt. I simply said “yum” but Neil expanded to call it a yummy blue with a good jam balance. 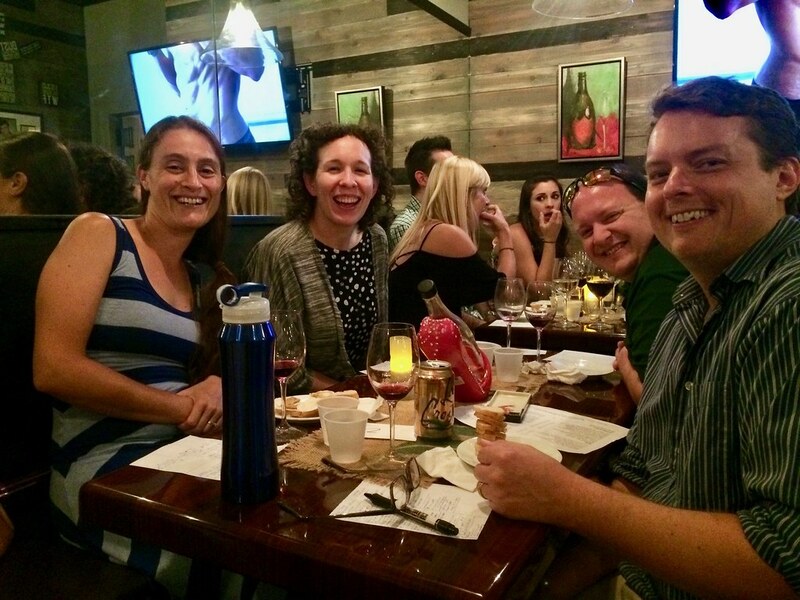 I think we were all surprised when we looked at the time and realized we had just wrapped up 2 hours of tasting wines and cheeses, but what a delicious 2 hours it was! Did we end up really comparing the French and British cheeses? Maybe we did but we spent more time trying to capture all the tasting notes before the next tasty cheese arrived. There was so much to keep track of between the cheese, the jellies, and the wines. 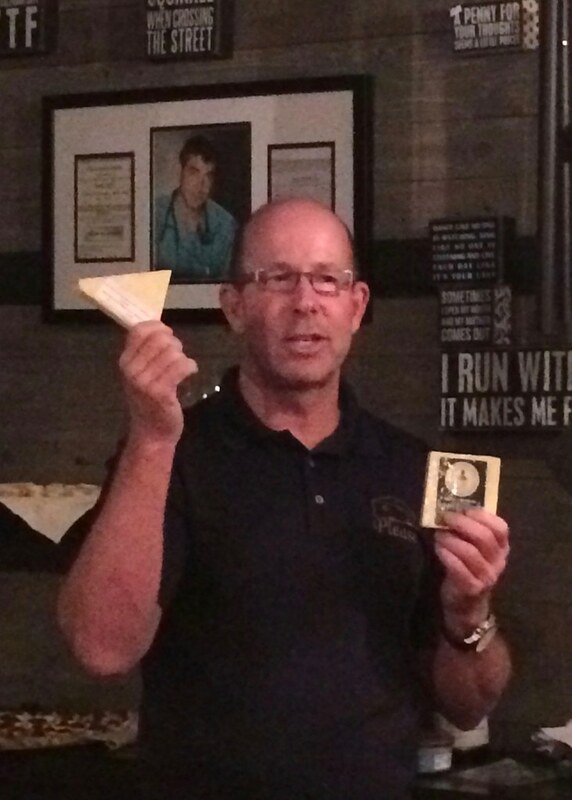 Neil’s favorite cheese was the Cana de Cabra, the aged goat cheese from Spain. Lucky for him the french goat cheeses were sent back because they were dried out or it wouldn’t have even been included. I think I enjoyed the cheddars the best but we all know that I usually don’t find a bad cheese. After all that cheese tasting, we visited the shop in the front and picked out 2 other cheeses to take home, potato chip gouda and idiazobal. We tried to find idiazobal a little while back when we purchased a petit verdot rose, how fortunate that they sold that same wine too. Looks like there’s another pairing on the horizon.